Here is the link. The interview starts at 17:48 into the hour: http://www.bbc.co.uk/programmes/p00qwbdp. It was a bit nerve-wracking at first, but Michael is a great interviewer, and the call-in was especially challenging and fun: 2012-04-25b-forum. It was particularly fun to walk around the old Laguna Honda with the photographer and tell him stories while he snapped photos. He especially liked the one about how, when we were digging up the valley where the new hospital was to be built, they kept discovering whiskey bottles, some going back to the early 1900s. God’s Hotel will be out April 26, 2012. Dr. Sweet will be on Michael Krasny’s KQED Forum on April 25th, 10 am-11 am. Call in, but be nice. There will be a Book Launch Party, Saturday, April 28th, 2012 in San Francisco. 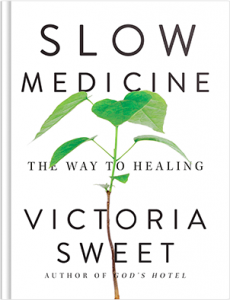 Dr. Sweet will appear at Politics and Prose, the iconic Washington DC independent bookstore on May 1. Bookstore appearances also include: Book Launch at Booksmith in San Francisco, April 27th, at 7:30pm. Book Passages in Corte Madera on Sunday, April 29th at 1 pm. Bookshop West Portal in San Francisco, on May 3. Books Inc. in Berkeley, on May 7, at 7:30 pm. Kepler’s in Menlo Park, on May 9 at 7:30 pm. Green Apple in San Francisco, on May 10, 7:30 pm. Dr. Sweet will be on West Coast Live, the live, syndicated San Francisco radio show, 10:am Saturday morning, May 12. Bookshop Santa Cruz, at 7:30 pm, Thursday, May 17th. Dr. Sweet will present at Authors@Google in Mountain View on May 31.